For nearly one year’s time, citizens in Chad have been unable to access the Internet, in spite of the UN Human Rights Council resolution of 1 July 2016 condemning any government that intentionally prevents or disrupts online access. Service providers attribute the disruption to technical problems, but organizations like Internet without Borders say that the government has ordered mobile phone companies to cut Internet access. It appears that the government is attempting to muzzle citizens’ freedom of expression and to prevent the free circulation of information. In Chad, the number of citizens with Internet access is proportionally the lowest in Africa. On average, 37.4% of people in the continent have access to the Internet. In Chad that rate is only 5%. The number of social media users is rising in other African countries, but in Chad it is a different story. In the twelve months to January 2019, social media use has fallen by 150,000 users, or 54%. 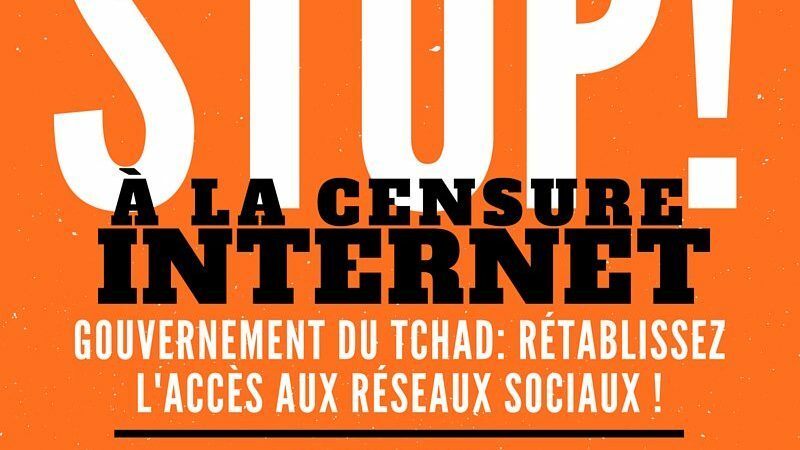 A poster calling on the government of Chad to “stop internet censorship” and “reopen access to social networks”. Reproduced with permission from the Africtivistes blog. There is a systematic ban on protests conducted by those whom the government sees as critical of any of its policies. Civil society actors and trade unionists holding unauthorized protests have repeatedly been the subject of police brutality. …There is frequent interference with the work of journalists, especially those reporting or commenting on human rights issues. Freedom of expression is curtailed and on several occasions in the past five years, .. amidst tense political moments. On 19 January 2019, Internet Without Borders launched a global campaign with the hashtag #Maalla_Gatetou, which means “why pull the plug?” in Chadian Arabic. The online campaign, coupled with marches in Paris and N’Djamena, aims to show the level of anger towards social media censorship among citizens. Si je comprends bien , l’impact des réseaux est tellement puissant que face aux kalachnikovs meurtrières de Déby,on trouve le combat déloyal ? ils ont compris qu’ils ne peuvent tenir le peuple en joue pendant tres longtemps. le CLIC et plus puissant que leur CLAQUE ! Campaign against internet censorship in Chad. The government has been preventing Chadians from accessing social networks for nearly ten months. It is an important issue that reaches beyond Chad. Many countries in Africa are now using this form of censorship systematically. The history of the internet has shown that Africa is the testing ground for the bad practices that violate hard-won freedoms. The rates for connecting to the Internet in Chad are also among the highest in the continent, rising to as much as 20 times the rates in other countries in the region. In February, Internet Without Borders began the second phase of their global campaign against social media censorship in Chad (#Acte2). Hello, my name is Bintou Datt, creator of women’s values, alter-globalist activist and pan-africanist. We are the people, we are young, we have fundamental human rights. I’m appealing to young people in Chad. Let’s rise together to defend our rights, to defend what is lawfully and rightfully ours. Today, with the disappearance of these young people from social media, we feel cut off from our friends, from our families, from ourselves and our inspiration. We cannot communicate and yet it is the simplest thing. It is the most basic of rights we can claim, but they cut us off from our friends. So dear young people, dear sisters, dear men and women, young and old, let’s rise together to lift this censorship and say “Stop. That’s enough. No more.” End the censorship of the young people of Chad. Long live freedom of expression. Long live international solidarity. Long live solidarity among the peoples, which, for me, is the only way. Let’s rise up together. Let’s take what is rightfully ours, let’s take what is our right. Access to information. Let’s rise up together. Hand in hand. Let’s fight to take back what belongs to us. Let’s fight to take back control of our lives. That will not happen without access to information or access to communication. Let’s rise up to speak with one voice. The young people in Chad. Thank you. End censorship. Be the first to comment on "One Year Without Internet in Chad: Citizens Have Been Offline Since March 2018"